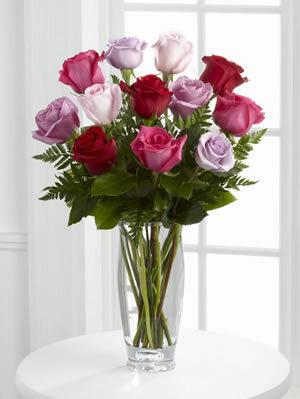 Presenting Captivating Color Rose Bouquet by Vera Wang. When you've got the world's most romantic designer imagining the flowers, you know the results are bound to be epic. Reflecting Vera Wang's understated but undeniable elegance, this exciting bouquet of our finest roses in shades of red, fuchsia, pale pink, light and deep lavender among lush greens is presented in a sleek, crystal clear glass vase with a subtle, sculptural flare. You can be confident that this bouquet will make you the star when you send it for Valentine's Day, Mother's Day, birthdays and anniversaries.